Chinese New Year starts with the New Moon on the first day of the new year and ends on the full moon 15 days later. On the Eve of Chinese New Year is a feast with families. Food includes such items as pigs, ducks, chicken and sweet delicacies. The family will end the night with firecrackers. Early the next morning, children greet their parents by wishing them a healthy and happy new year, and receive money in red paper envelopes. The Chinese New Year tradition is a way to reconcile; forgetting all grudges, and sincerely wish peace and happiness for everyone. New Years day in 2011 is February 3rd and festivities vary from country-to-country for up to 15 days afterward. The following cities have made my list of the top 8 Chinese New Year's celebrations outside of Mainland-China. In the weeks before and after Chinese New Year, Chinatown celebrates with a dazzling outdoor light-up, street stalls packed with festive treats, and auspicious Chinese lion dances. But don't stop there, for the city has much more in store. Explore the cultural village of the River HongBao at Marina Bay, and don't miss Asia's grandest street and floats parade, the Chingay Parade Singapore, in front of City Hall. It started off in the 1970s as a street parade to 'raise the volume' during Chinese New Year. Today it has participants for Chingay 2011 come from almost every continent. Although Chinese New Year officially falls on Thursday, February 3, all the action is on the following Sunday. Stands, stalls and marquees will line Chinatown, Shaftesbury Avenue, Trafalgar Square and everything in between. Impromptu parties will break out and Chinatown’s usual frenzied pace will be turned up a few notches. The action kicks off from 11am at Trafalgar Square, where the entertainment will include Mongolian bowl dancers, Chinese and Tibetan singers, the Hua Dan dancers of the Beijing Opera and a host of other traditional and contemporary troupes and solo performers. There’ll be a dazzling pyrotechnic display as well. 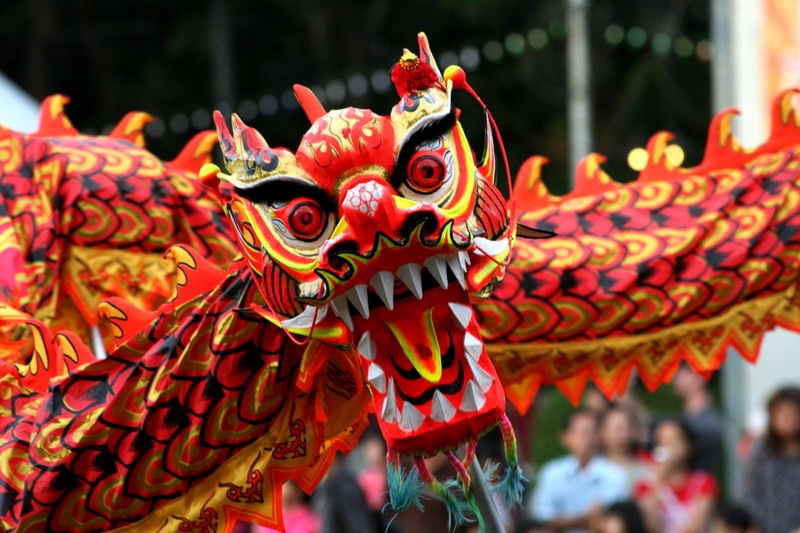 Millions of people gather around the city to watch the joyful parade that encompasses multihued dragons, enthusiastic dancers, cheerful musicians, magnificent flags, and powerful Chinese influence. The Chinese bistros are teeming with locals and visitors to savor the food along with music, dance, and film festivals. Paris' Chinese community celebrates the dawning of the Chinese New Year on 3 Feb, 2011. A colourful parade featuring giant serpents, firecrackers, music and dancing takes place in the heart of Chinatown, between Place d'Italie and the Porte de Choisy, in the 13th arrondissement. San Fran boasts the oldest Chinatown in North America and the largest Chinese community outside Asia and, as such, it comes as no surprise that hundreds of thousands of tourists come to this city just to witness the magnificence and diversity of the Chinese New Years parade. The celebration originated in the 1860's during the Gold Rush day and is now the largest Asian event in North America as well as the largest general market event in Northern California. The celebration includes two major fairs, the Chinese New Year Flower Fair and Chinatown Community Street Fair. All the festivities culminate with Chinese New Year Parade. Named one of the world's top ten parades, Chinese New Year Parade in San Francisco is the largest celebration of its kind outside of Asia. Over 100 units will participate in the parade, many of the floats and specialty units will feature the theme of this year's Chinese zodiac sign. Nowhere in the world will you see a lunar new year parade with more gorgeous floats, elaborate costumes, ferocious lions, and exploding firecrackers. Some of the parade highlights include elaborately decorated floats, school marching bands, martial arts group, stilt walkers, lion dancers, Chinese acrobatics, the newly crowned Miss Chinatown USA and the Golden Dragon. Home to Canada's largest Chinatown and a large ethnic Chinese presence in Vancouver—especially represented by multi-generation Chinese Canadians and first-generation immigrants from Hong Kong—the city is often referred to as "Hongcouver." With such ties to China and Hong Kong it is no shock that Vancouver hosts a vibrant Chinese New Year celebration. 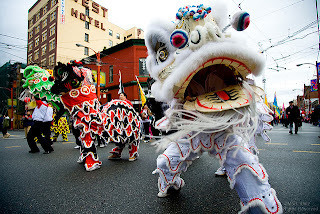 Vancouver's Chinatown Spring Festival Celebration takes place on Sunday, February 6th, 2011 With lion dances, cultural dance troupes, marching bands and more, this parade is a cultural extravaganza not to be missed. According to the City of Vancouver, the parade is one the three largest non-commercial annual parades of Vancouver. The parade features the largest assembly of traditional lion dance teams in Canada with dozens of colourful and energetic lions from the various local fraternal and martial arts organizations. Sydney's main Chinatown centres around Sussex St in the Sydney CBD, Sydney. It stretches from Central Station in the east to Darling Harbour in the west. It is Australia's largest Chinatown it plays host to the biggest celebration of the Lunar New Year outside Asia. This year’s Festival features more than 50 cultural events including food, entertainment, visual art, film, workshops, talks and tours. Festival Highlights include: Chinese New Year Markets, Chinese New Year Twilight Parade, Sunday, February 6th. Dragon Boat Races, Feb 12th-13th at Cockle Bay (The largest Dragon Boat racing spectacular in the Southern Hemisphere). Bangkok's Chinatown is centered on Yaowarat Road (เยาวราช) in Samphanthawong district and it is also ground-zero for Bangkok's Chinese New Year celebrations. On both February 3rd and 4th from noon to midnight, Yaowarat Road will host the main events of the festival. You can see colorful dragon processions, lion dancing, and Chinese cultural performances such as Chinese opera. Be sure to get there before 3 pm on Thursday, February 3rd, because Her Royal Highness Princess Maha Chakri Sirindhorn will officially open the event and all traffic in and out of the area will be stopped. The city is preparing to welcome a record number of visitors, drawn by shopping bargains and host of festival-related attractions. Chinese New Year partying for 2011 runs from Thursday, February 3 to Sunday, February 6 and is a time for gathering among family and friends, eating, drinking and shopping. More than 650,000 visitors are expected in town, with the Hong Kong Tourism Board predicting a rise of 15 percent in the number of mainland Chinese tourists - traditionally the city's biggest market. And the city is pulling out all stops to entertain visitors to town, including lantern displays, a massive flower market and the city's annual New Year float parade through the Tsim Sha Tsui shopping district on Thursday and a massive fireworks display over Victoria Harbour on Friday night. 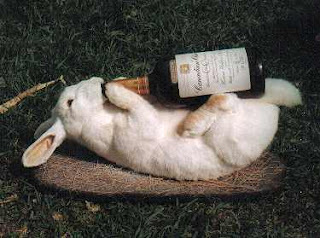 Wherever you end up this Chinese New Year be sure to pick up a Chinese beer (Tsing Tao), some Chinese spirits (Baijiu) or rice wine and party hard to give the Year of the Rabbit a warm welcome.